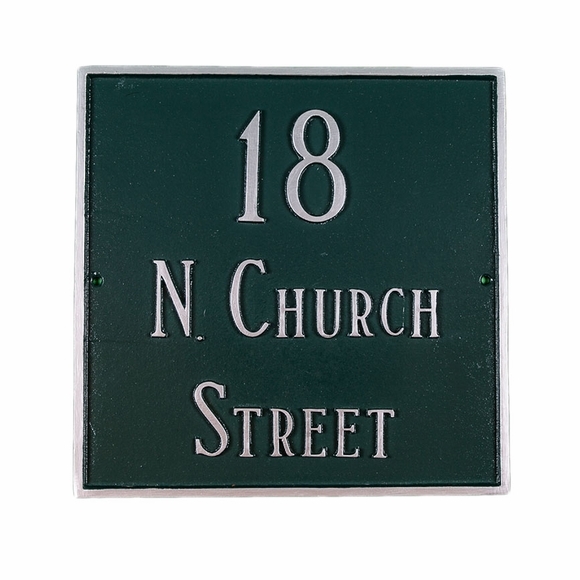 Personalized Large Square Address Sign - - 15" x 15" square address plaque or 18" x 18" square address plaque personalized with up to three lines of custom text. Made in USA. On the 15" x 15" sign, each line of text holds up to twelve 2" characters (including spaces). On the 18" x 18" sign, each line of text holds up to thirteen 2" characters (including spaces). If you have 13 characters on any line, you will need to order the 18" x 18" sign. Please count carefully. It is not necessary to use all three lines. If you are not using a line, leave the input box blank. Dimensions: 15"W x 15"H or 18" x 18".